Forty-four years ago, the highlight of Seattle's first ever Gay Pride Week was a picnic in Pioneer Square attended by 200 people. Today, PrideFest attracts as many as 50,000 people to Seattle Center and Capitol Hill, as well as events across the city. What started as a protest has become a victory celebration and a testament to the progress made toward LGBTQ freedom and equality. Of course, it's easier to have a blast if you know which of the dozens of events to hit -- from early morning dance parties and booze cruises, to who knows how many drag shows. That's where we come in. Here’s how to celebrate Pride in Seattle this year. The Pacific Science Center's Laser Dome is adding 17 new and reimagined laser shows during its first ever Summer of Light, including this Pride-themed night featuring the radio station's Harmony Soleil. Seattle's most creative movie theater wants you to sing along to over 25 queer cuts and classics from Broadway and beyond. And presumably eat the pizza and drink the booze they’ll be offering. There's a ton of events going down at Timbre Room all week, but the highlight is this Patio Party Series: an outdoor pre-funk featuring some of the city's most loved drag queens and DJs. Nark Magazine is putting on its own mini-festival boasting nine different events including everything from rooftop parties, to a booze cruise, a warehouse rave, drag competitions, a hip-hop show, and much more. This event started in San Francisco but has made its way north just in time for Pride. It’s meant to provide a platform for emerging queer hip-hop artists, DJs, and dancers to showcase their talents. Seattle's most famous chef is turning his South Lake Union tavern into the Brave Unicorn Tavern for the night, offering pride-themed food specials, and their usual can't-miss pretzels. This unsubtly named boozer's three-day indoor/outdoor party boasts two stages, two dance floors, multiple bars, food vendors, a VIP lounge, and performances by 25+ LGBTQ entertainers. The day starts at the legendary Cap Hill bar with a brunch party at 10am, followed by the main event out back at 5pm featuring a riotous (and free!) drag show. Boasting a beer garden on a traffic-less (for once!) Broadway, slushie machines churning out frozen avocado margaritas and frosé, and Jell-O shots, NB might just be the best place to spend the fest's first day. Spanning Broadway from John to Roy, Seattle's fifth annual Pridefest packs the streets of Seattle's hippest and most LGBTQ-friendly ‘hood. There will be three stages featuring drag shows/contests, DJs and much, much more. KEXP's new-ish Gathering Space is hosting lives show, DJ sets, and more, as well as serving up craft beer and specialty vodka cocktails. From 6-7:30pm, the Seattle Parks & Recreation Aquatics Unit is hosting a free LGBTQ Pride Swim where everyone is welcome. It's not like people need an excuse to go to Sounders games, but a portion of every Pride Night ticket purchased through the link above will go to fund scholarships. Just blocks from the parade’s starting point, this early morning affair starts at 7am and features a live DJ set, T-shirt printing, and karaoke. 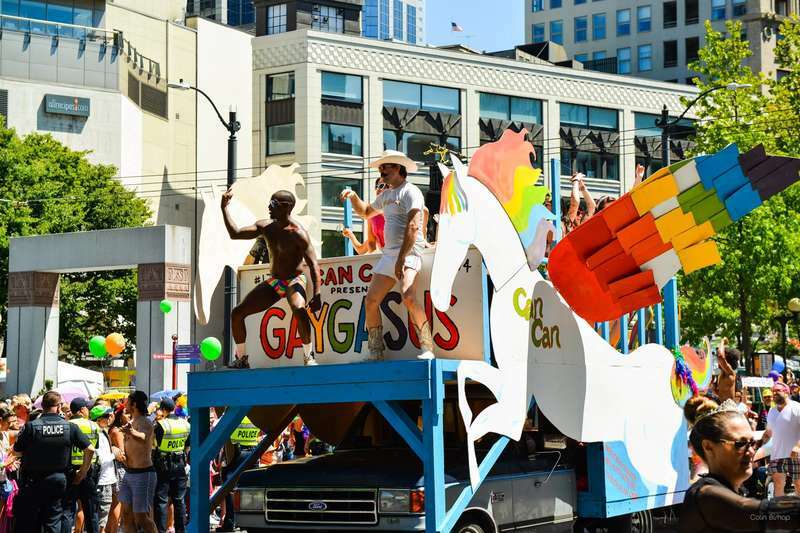 The 44th annual Seattle Pride Parade will start at Fourth Avenue and Union on Sunday afternoon and end at Second Avenue Seattle Center... just in time for the second day of Pridefest. For the 12th straight year, PrideFest is descending on Seattle Center with... well, more live entertainment than we can accurately sum up here, on four different stages. Bradley Foster is a former Thrillist editor whose favorite "fests" typically involve food, but he'll make an exception for this one.